1. 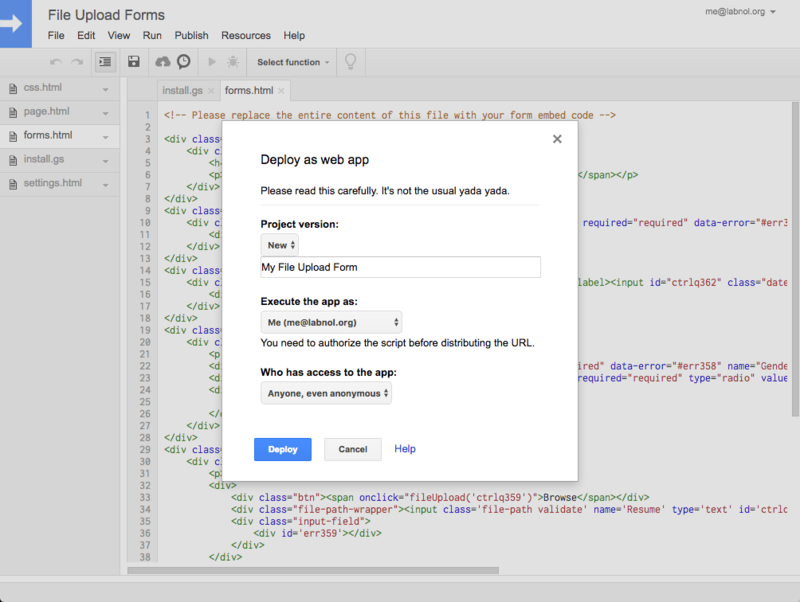 Go to forms.studio and design your form using the WYSIWYG editor. You can even embed images and videos in your Forms. 2. 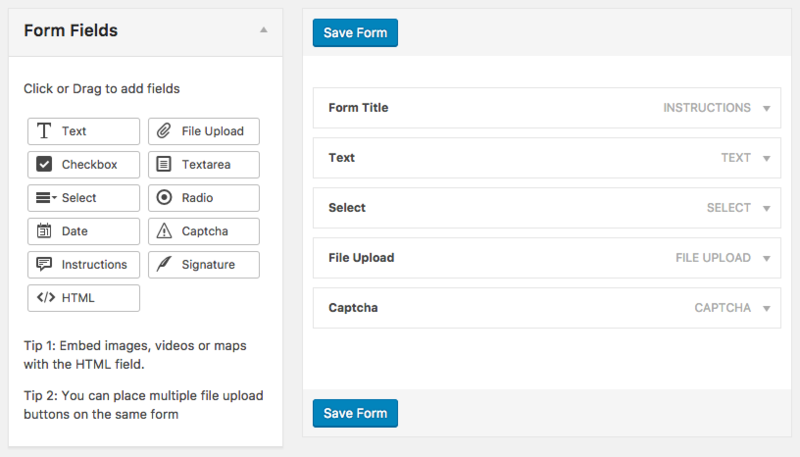 Save the form and click Preview Form Design to check the layout of the draft form. Copy the embed code from the Form Preview page on to your clipboard. 3. Open the Google Spreadsheet that was automatically created in your Google Drive with the premium license. The form responses will be stored in this sheet. 4. Go to Addons > File Upload Forms > Form Settings and authorize the File Upload Forms script. The script runs in your own Google Account and even a single byte of data never gets shared with anyone. 6. Inside the same Google Spreadsheet, go to Tools > Script Editor. 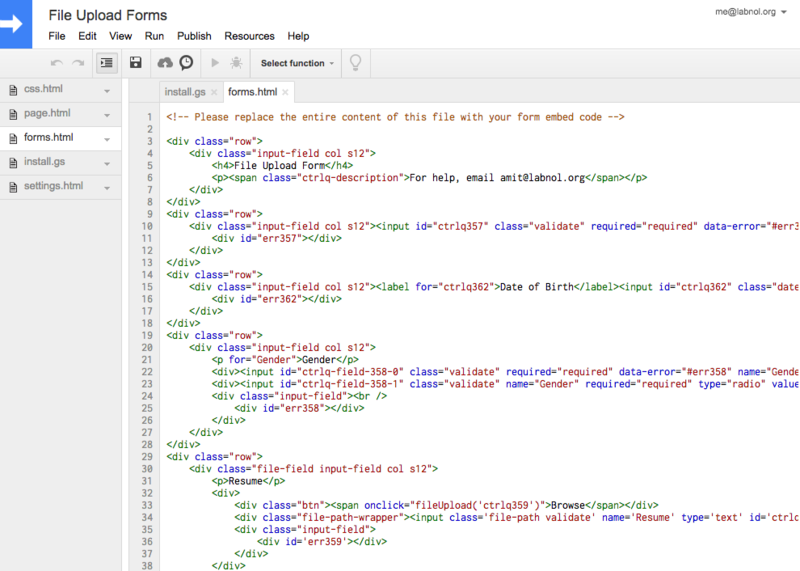 Switch to the forms.html file and paste the HTML embed code. Save your changes. Click Deploy and make a note of the web app URL. That’s your File Upload Form page that you can share with the world. For help, please refer to the File Upload Forms documentation. This guide is also available on Google Slides.